Two seats are open this year. Seat 2 has been held by Mike Long since 1999. My how time flies! Becky is not running again. Earl Maucker automatically renews since no qualified candidates entered the race against him. The Lighthouse Point Chamber is hosting a bi-partisan Candidate Forum in advance of the March election. Taking place on February 25 from 6-8 p.m., the event will be held in the City of Lighthouse Point at Dixon Ahl Hall, 2200 NE 38 Street, Lighthouse Point. City Commission Seat #1 : Tom Hasis lost to Earl Maucker by about 5% of votes. 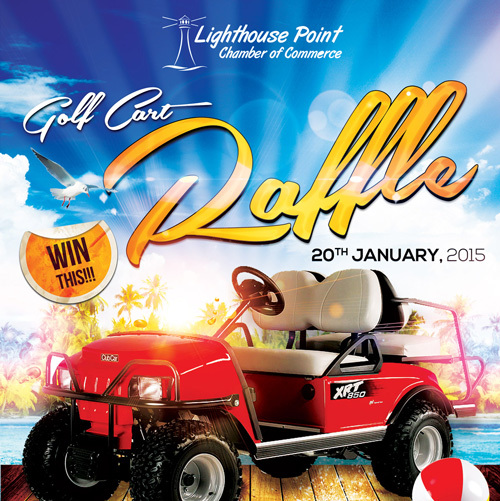 Win this golf cart at the Taste of Lighthouse Point 2015! Only 500 tickets will be sold for the raffle. Call 954-946-3838 to order. You do not need to be present to win. Shop and save with the American Express Small Business Saturday®, Nov 30. Small Business Saturday is a day to rally people nationwide to get out and Shop Small®. American Express has an interactive map to help American Express Card Members find and shop at small businesses. Card Members get an exclusive offer* redeemable only at qualifying American Express Card accepting small merchants that appear on the Small Business Saturday Map. I don’t know what the deal is this year, but in prior years, I had customers get a $25 credit for shopping at my store. Pretty great deal for both parties. The entire amount was paid by American Express. To be part of the offer, you must sign up by Nov 4 to be included on the map so Card Members know they can redeem the offer at your business on Small Business Saturday.